Dragon talks! 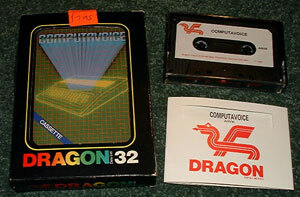 Program your Dragon to speak, even in regional accents, with this remarkable voice synthesiser. Then start to build up whole sentences, using easily understandable techniques. 'Dragon talks!' and it does!, not too sure about the regional accent thing (I always though it had an American accent myself). But when I first heard this back in '83 I was astounded and it was great to get speech out of my own programs.